Mr. Diat, who oversaw the kitchen of the Ritz Hotel in New York for many years and authored several excellent volumes on French cooking in the home, raises the issue of economy in the kitchen in the introduction to his French Cooking for Americans. One good place to practice it, in his opinion, is in the making of stock. Mr. Diat describes the kitchen in his childhood home as a place where real economy (as exemplified by the stock pot) was practised, as opposed to false economy (skimping on or foregoing the use of relatively costly ingredients when they are an essential part of a dish.) 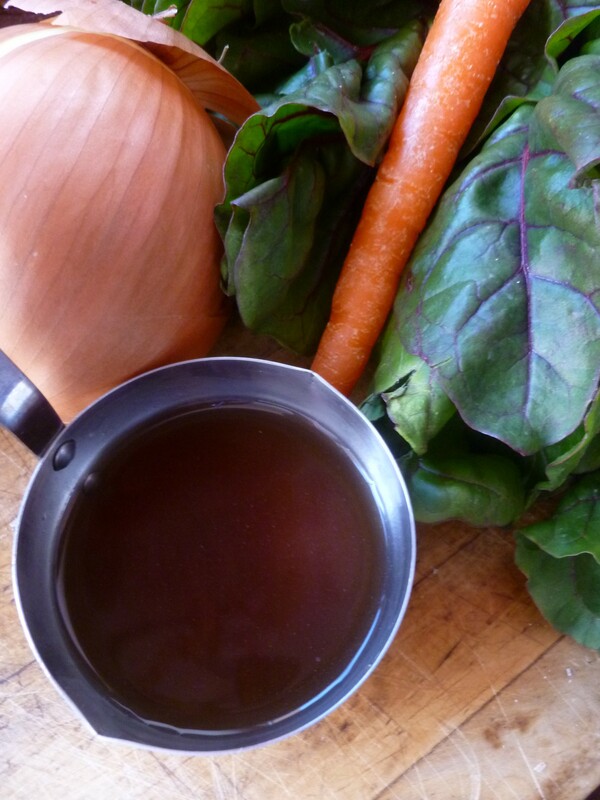 The Vegetable Bouillon used to make Red Wine Onion Soup Gratiné is a small effort to apply a little of the kitchen economy of yesteryear to the present. A Timing Note: If using the Homemade Vegetable Bouillion for the soup, prepare it a day or so ahead, for it requires hours of simmering. 6 – 12 toasted rounds of Bread from a sturdy, country-style loaf. The number will depend on their size: The dk version uses slices of bread from Rustic Loaves. The recipe is here in this previous dk post. 1. In a large, heavy saucepan cook the onions in the butter over moderate heat, stirring them occasionally for about 20 minutes. Sprinkle them with the sugar and cook them for about 20 minutes more or until they are caramel-coloured. 2. Sprinkle 1 Tablespoon of flour over the onions and cook them, stirring for another 2 minutes. 3. Add 6 cups of vegetable bouillion and 1/3 cup of red wine and the thyme. Bring the onions and liquid to a simmer, stirring to combine everything well. 4. 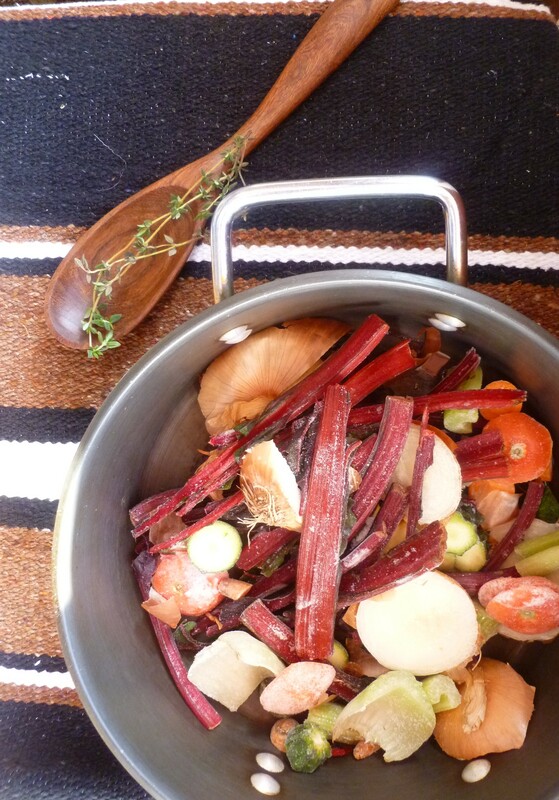 Transfer the soup to a Dutch oven or other pot. Add some Kosher salt to taste and several grinds of fresh black pepper. Simmer the soup, covered, for 30 minutes. 5. Preheat the oven broiler. 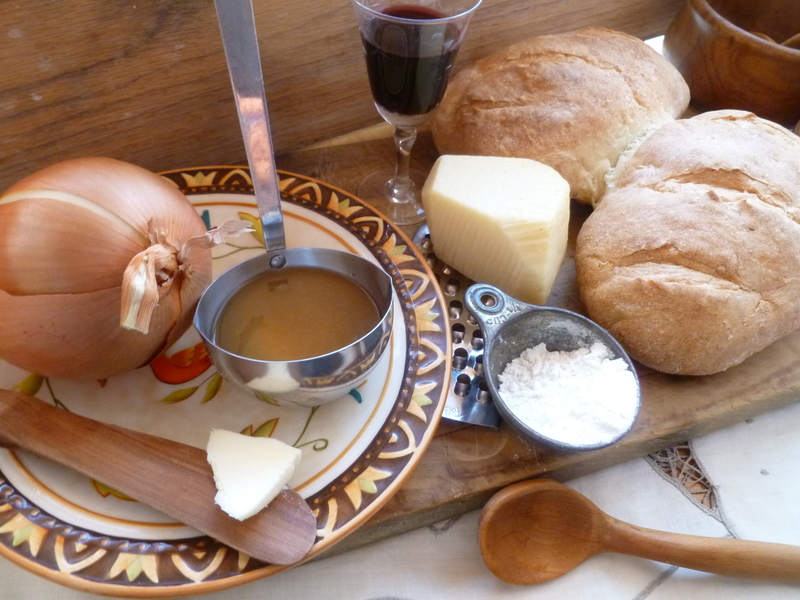 Place the rounds of toasted bread on top of the soup and sprinkle them with the combined Parmesan and Gruyère cheeses. Place the pot of soup under the broiler for a couple of minutes, until the cheese is melted and golden. 6. 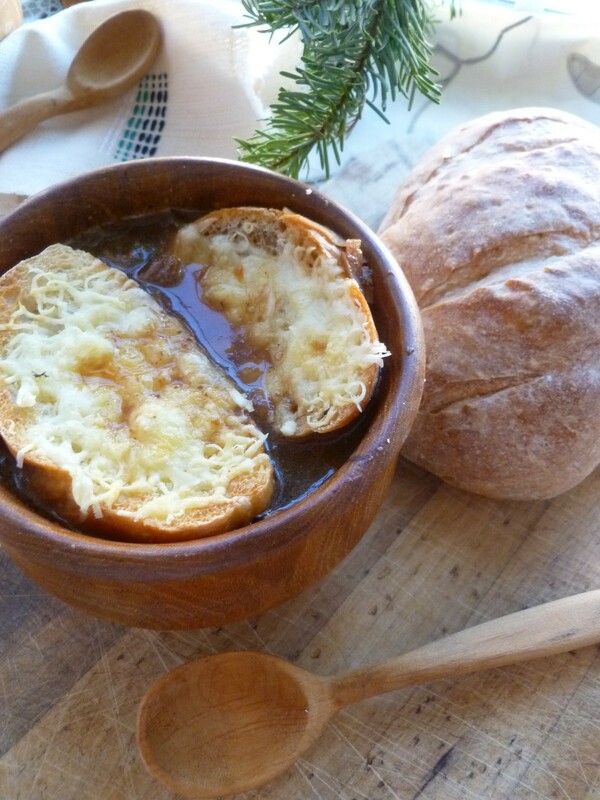 Divide the soup among bowls and top each bowl with 1 or 2 rounds of the melted cheese toasts. II. How to Make Homemade Vegetable Bouillion (for about 8 cups): This recipe is given in the form of a general description. The ingredients will depend on what is in the kitchen and the taste and ideas of the cook. Whenever cutting up vegetables, collect the end pieces and bits that, in Mr. Diat’s words, ‘have no use’, and put them in a gallon-size freezer bag. (The collection might include, for example, pieces of onion, a few pieces of brown onion skin to give the bouillion a nice chestnut color), celery leaves, tomato, zucchini, turnip, lettuce leaves that are not quite nice enough to use in the salad, and the stalks of greens.) Store the collection in the freezer, adding to it until the bag is full. Add water to cover them. Add whatever fresh or dried herbs you have on hand (thyme, for example), a bay leaf and some salt and pepper. Bring the pot to a simmer. Lower the heat and simmer the vegetables in the liquid very gently, covered, for 3 – 4 hours. At the end of that time, turn off the heat. Leave the vegetables to steep in the bouillion until it is cool. Then strain the bouillion through a strainer into a large bowl. Discard the vegetables. Taste for seasoning. The bouillion may be flavored with the addition of a chicken or beef bouillion cube for recipes that call for chicken or beef stock. It keeps well for a week or more stored in glass jars in the refrigerator, or for much longer frozen. 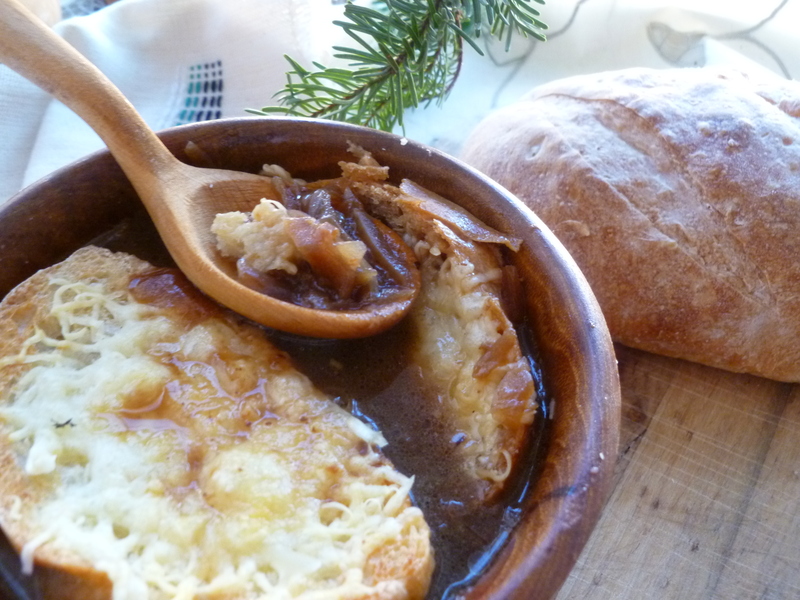 A Note: This version of Red Wine Onion Soup Gratiné is adapted from a recipe that appeared in the November 1973 issue of Gourmet. 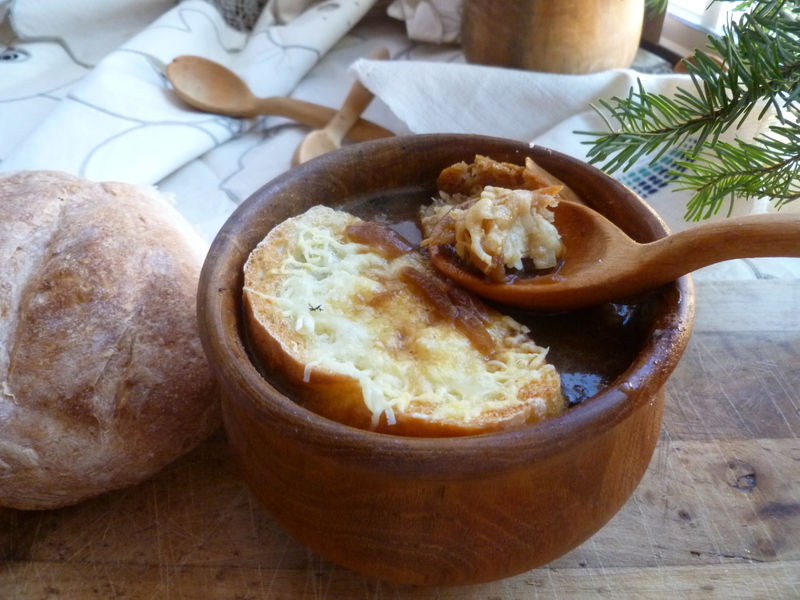 The soup is served for supper as part of the Occasional Menu: Blunting the Keen Tooth of Winter: A Supper Party following an Out-of-Doors Afternoon.